Smooth spread with a refreshing and sweet fragrance. You can use this oil as you want, for cooking and for health care. It’s gaining popularity in Europe and other areas. 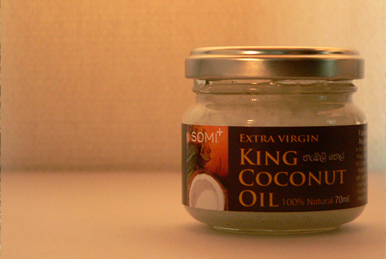 Extra Virgin Coconut Oil is extracted by a raw manufacturing method. Ripened coconuts grown in a natural way in the tropical area of Sri Lanka are picked, sundried, and pressed for oil. This oil is never refined and 100% pure. Helps keep your skin soft and smooth. Is suitable for frying and heated cooking. Contains a high amount of Lauric acid, an easily absorbed fatty acid which is also contained in mother’s milk. Is smooth and is become solid under 26?(78.8°F). For hair care…Good for Ayurvedic head massage and body massage. For shining hair and whole body care without stickiness. Safe for babies and moms. For cooking…Makes a crunchy toping on ice-cream with a sweet coconut flavor. Fish fritter fried in this oil makes fish smell less and makes fish bones crunchy. Kids will eat fish cooked with it because it adds sweet coconut flavor.